Today’s Electronic PCB Assemblies are manufactured with high density chipsets and multilayer PCB’s. Testing of these PCBA’s require high end test equipments which increase the repair cost compared to manufacturing cost which small and mid range repair shops cannot afford. 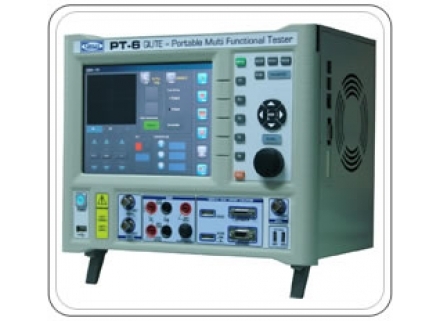 The Qmax PT6- Portable Multi Functional Tester can be the best cost effective choice for testing today’s PCB Modules since it offers multiple measurement modules in a single cabinet. • Dual Channel Digital Storage Oscilloscope. • 4 ½ Digit Digital Multimeter. Overview Today's PCBs are so complex in nature and with more of proprietary devices. In most cases the schematics and internal functional details are un available for third party maintenance personnel. Thus diagnosing faults in such PCBs are difficult task using conventional test instruments such as multi-meter or oscilloscope that are normally found in repair shops. Today’s Semi-con devices are more reliable than it was a decade ago but still reliability is not 100%. When they fail, most likely the faults occur on the periphery of devices i.e. I/O pins as they are more susceptible to damage by external forces such as lightning, short circuit, over load etc, these can be easily tracked by VI – Curve, the nodal impedance test.QSM-VI is an industry’s proven V-I Trace technique of learn and compare of Nodal impedances plus certain enhancements which are unique to Qmax. Using this technique the technician only requires a known good board for comparison with a faulty one without having the need of schematics and functional details of such PCBs. The known good board’s VI traces can be learnt and stored for future reference as well. The In-Circuit Measurement module can be used to measure the accurate value of Resistance, Capacitance and Inductance in the populated PCBAs. The Auto balancing bridge method used for most accurate with wide impedance measurement. Multipoint guarding (6 –wire measurement) are implemented to nullify the parallel impedance across the measurement nodes and allow them test in-circuit with accurate value. This module can be used to validate the manufacturing process such that assembly of right components located in correct place and soldered properly in the printed circuit boards. The module uses the Power-off test, eliminates the potential of damaging an assembly due to possible unintentional short –circuits introduced during manufacturing process. The Short locator is a Virtual Instrument that can be used to Measure contact resistance of Switches and Relays. It can also detect exact short circuit locations across VCC - GND or a shorted component connected across a Bus and hair-line shorts between PCB tracks.By using Offset Mode, the residual resistance of a shorted component or nodes can be offset digitally, so that the instrument can be used at the higher sensitive range of 200 milli-ohms in order to locate the short. It is designed to apply a constant current with a stimulus voltage of less than 200 mill volts so as to avoid turning on the semiconductor devices in the circuit. 4-wire measurement technique is used for enhanced accuracy. Resistance dependent, modulated frequency audio tone output (whose pitch increases with decreasing resistance value) is also provided which helps the user to quickly home on to the shorts. PT6 include a 2 MHz Arbitrary Wave form Generator (AWG) which can be used for low and mid range applications. Basic wave forms such as Sine, Square, Ramp, pulse and user defined wave form patterns are provided. The PT6, 20 Mhz -Digital storage oscilloscope is ideal for low end measurement in repair & recovery and for educational lab / training applications. The maximum sampling rate of 200MSample/s and maximum memory depth. As a result they can display the signals accurately, right down to the details as well as provide high time resolution. Their wide and very sharp 8.4” color TFT display with high resolution makes even the smallest signal details visible. • 8.4 inch wide Large display with Touch Interface. • Push buttons and knobs enable multifunctional operation made easy. • Truly Portable for bench top application. • Separate connector for individual instrument*. • Embedded Keypad for user-friendly probing. • External Mux channel interface. • Dual channel VI Signature for Instant comparison. • Best Curve fit to reduce the manual learn complexity which need technical expertise. • External Mux channel interface for multipin / clip based testing. • Embedded key probe facilitates user friendly probing and no need for third person assistance. • Frequently used functional operations can be mapped in Embedded keys. • 4 and 6 wire measurements . • In 6 wire the error will be 1% for guarding ratio 10 and 10 % for guarding ratio 100. • 4 channels of low impedance guard buffers with maximum source current 1.2 A.
of semiconductor diode during testing. • 4 wire resistance measurement. • Complimenting modulated audio tone. • Resistance range of 200 mΩ,2Ω and 200Ω. • 100µΩ resolution in 200mΩ range. • Offset Capability up to 200Ω. • 0.5 Hz to 2 Mhz Frequency. • Sine, Square, Ramp, Pulse, PWM, AM and FM waveform. • 2 Kb Memory for User defined waveform. • 20 MHz bandwidth, 200MSa/s sample rate. • 8.4" Large TFT color display. • Save/Recall setup and waveform data. • AC+DC True RMS Measurement. • Up to 20 reading per seconds. • CAT I(1000V) and CATII(300V) protection. • Resistance up to 20MOhms, Voltage up to 1000 Volts and Current up to 3 Amps.